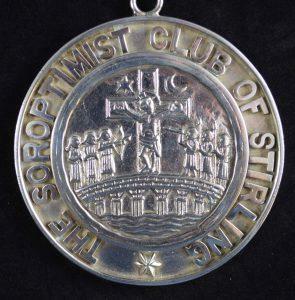 The sterling silver President’s chain and badge of office of the Soroptimist International of Stirling Club 1959 -2016 was one of many fine gifts to the Stirling Smith collections last year. It is always sad when a long – running organisation ceases to function, but the Smith looks after the memorabilia, and Stirling Council Archives look after the archival records, of such local organisations. Soroptimists International was founded in California in 1921 by business and professional women who wanted to help change the lives and status of girls and women world – wide. Today there are still 75,000 members in 133 countries, working to educate, empower and enable with the slogan ‘women inspiring action, changing lives’. The Stirling chain and badge were designed by art teacher and founder member, Janet Reid Burnet (1913-2008) who, disabled herself, was a life – long champion of sporting opportunities for the disabled. She also hosted visiting artists from overseas and sponsored the first designer bench in the Smith grounds. Like each of the 49 women who held the chain of office, she made a unique contribution to the life of Stirling. Other office bearers include Helen Munro MBE, Director of Community Services with Stirling Council until 2005 and Lady Martha Bruce OBE TD, founder and first Governor of Cornton Vale Prison, 1975 – 1983.